Sugar Publishing, Inc., a privately owned media company that produces a network of blogs and ecommerce sites for women, leased 15,300 square feet at 3525 Eastham Avenue in Culver City’s Hayden Tract this month. Sugar follows Mahalo Inc., another digital media company, who leased 13,300 square feet in November at the same property and also left Santa Monica in search of more affordable creative offices. Culver City has become one of the best Westside alternatives to Santa Monica for creative space at significantly lower rents. The area is now a hotbed for entertainment and media companies due to its prime location on the Westside, its new restaurant and art scene, and its plentiful supply of converted warehouses. 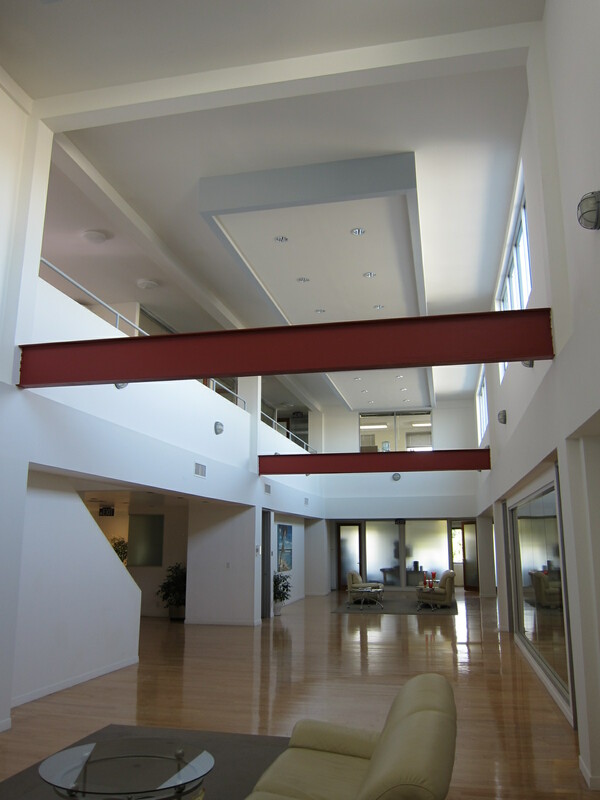 With 3525 Eastham being positioned well in the Hayden Tract, PMI designed the building with creative companies in mind. According to Jeffrey Palmer of PMI, “PMI originally designed 3525 Eastham for software and web based companies that need high density while maintaining a creative environment; although the design works very well for entertainment companies as well.” The 24 foot soaring bow-truss ceiling, multiple oversized glass roll-up doors and numerous skylights help create a sense of spaciousness even with very high employee counts. The City of Culver City is very interested in attracting digital media firms to the area. It recently committed to purchase 180 parking space privileges in a parking structure to be built by a local developer. Culver City has invested in parking and transportation infrastructure (including new redevelopments at the nearby Expo light rail station at Washington and National) to help entice these new digital technology companies to Culver City. In addition, a new Hayden Tract Owners Association has formed to build 120 additional parking spaces on a former Cal Tran easement and to promote other improvements to the Hayden Tract. Sugar Publishing has expanded from their San Francisco & New York locations to begin their tenure in Los Angeles. Sugar prides itself in providing their 20 million global unique users insanely addictive content, unmatched shopping experiences and a robust social community. The company has two business segments focusing on original content and commerce with a portfolio of brands including PopSugar, FabSugar, BellaSugar, FitSugar, GeekSugar, PetSugar, and PopSugar Retail Therapy. Cementing their spot as a media force to be reckoned with, in May 2010, Sugar was named among the Hottest Companies in San Francisco. Sugar’s employees are extremely passionate about the brand, which shows in the amount and quality of content they produce on their numerous sites. Brian Sugar currently serves as the company’s CEO and Publisher, while Lisa Sugar is the company’s Editor-in-Chief. According to their website, the story behind the creation of Sugar, Inc. came from a comment at Oscars party Brian and Lisa Sugar threw at their home in February of 2005. In 2006, they received Series A Funding from Sequoia Capital and have been expanding ever since. During the pre-leasing process, PMI Properties was represented by David Wilson of Lee & Associates and Sugar Publishing, Inc. was represented by Matt Brainard of Studley, Inc.
PMI has edgy creative buildings with a lot of startups as tenants. These startups are attracted to PMI’s creative spaces in smaller buildings. We emphasize great architecture and build communities for the tenants to interact with each other. Many of our tenants over the years have been acquired as a method of their exit: Applied Semantics, AZ Razorfish, Guardian Edge, Apture, Playdom, Techcrunch, and Doubleclick to name a few. Once these firms are acquired, the corporations want the firm to integrate into the ‘mothership’. They will either wait for the new acquisition’s lease to expire, try to sublease the space, or offer a buyout option. These large corporations have facility managers who also demand a different set of services. They want a state of the art security service and will sacrifice the edgy aesthetics to achieve it. Sometimes the acquired company fights for their independence within the corporate structure. These companies want to keep an identity and culture separate from the acquirer. Zappos is a classic case of such a company. They stayed true to their culture when they were acquired by Amazon. In fact, Amazon actually strongly encouraged Zappos to stay true to their roots– it was part of what made them so unique and special in today’s Internet marketplace. Another example is that in PMI’s buildings, Techcrunch renewed their lease versus moving into an AOL facility. Keeping their old digs was one way for Techcrunch to retain their independence from AOL and maintain a separate culture at the same time. Overall, corporations keep their goal of wanting to move the new startup acquisition to a space that falls more in line with the main, home office of the corporation. This occurs at the same time as having the startup stay true to their founding identity and what made them so attractive to acquire in the first place. A balance between the two needs to be maintained and sometimes it is a fine line to reach. Culver City is doing many things to make the city attractive to new businesses that would occupy creative offices. The city is working with the Hayden Tract Property Owners Association to create 120 new parking spaces on the rail spur in the Hayden Tract. These parking spaces will be just west of Stellar between Eastham and Hayden Avenue. Recently, the city boldly moved at the end of January to pass three redevelopment properties that could benefit creative office tenants in the Hayden Tract. For example, Culver City committed to spend $5 million dollars to purchase 180 parking rights for public use in a new parking garage. This garage is slated to be built on Higuera and Hayden by Hackman Properties. This garage will supplement a new 500 car garage at La Cienega and Jefferson recently completed by Cal Tran in conjunction with the opening of the Expo light rail later this year. In addition, new street parking along National Boulevard between Washington and Jefferson has been added. The Syd Krononthal Park at Eastham and National has received a new signal and a cross walk leading to it. Not only will Culver City have an elevated Expo light rail station at La Cienega and Jefferson, but it will also have a similar station at Washington and Venice. A new bike line and walking path will span the entire length of the light rail line. Culver City is expected to build a pedestrian plaza and make landscape improvements around the station. A temporary 600 car parking lot will be provided on the city’s land near the station as well. The City also approved in late January an agreement with Lowe Development to sell this land parcel next to the Culver City light rail station so Lowe can build a development. This future development area will have a mix of housing, office, retail and restaurant use. These developments will be surrounding a large central open space amenity that will connect seamlessly with the new station. In addition, the development will include 1,500 parking spaces, some of which will be for monthly rental to Hayden Tract owners and companies. Close by, at Culver and Washington (9300 Washington), Culver City at the end of January committed to sell Hudson Realty and Combined Properties’ land to build a mixed use project. The proposed project includes ground-level retail, a four-story office building, and a grand stairway that leads pedestrians up to a restaurant pavilion. There will also be a landscaped elevated plaza perched above the existing Town Square. The City in late January committed to sell land to build a new state of the art jazz club that will be operated by the Jazz Bakery. The City has aggressively been courting new creative companies to locate in Culver City. Unlike other Westside cities in Los Angeles, Culver City has displayed the ability to meet with companies and offer expedited permitting for their improvement. Creative office tenants appreciate Culver City for it’s rich urban experience. Culver City attracts young, knowledgeable workers due to the mix of chic restaurants, vibrant bar scene, new art district, the close proximity to affordable apartments, and easy access to Santa Monica, Hollywood, and Downtown Los Angeles. Playa Vista, a competitve location for creative companies, lacks this rich urban experience. In 2000, Culver City became a magnet for entertainment and internet companies fleeing the high rents of Santa Monica. Culver City had a plentiful supply of architecturally attractive industrial buildings preferred by the creative types. At the current time, however, Culver City is addressing the insufficient parking problem that many of these buildings have. Culver City has a rich history of bold moves in redevelopment. It invested heavily in infrastructure and parking in its downtown district. Culver City went so far as to build and own a multiplex theatre and Trader Joe’s in early 2000. The current new developments come as no surprise from a city that is always in the forefront of innovation. Culver City has done an amazing job creating and executing the many improvements that will make it one of the prime locations to live, work, and play. PMI’s former tenant Stylespot.com went from small offices to grand success in the past few years. Stylespot helps consumers link celebrity photos with stores that sell the fashions worn by the celebutants. Stylespot started in a 300 square foot office in PMI’s highly creative Penthouse suites, which resemble a New York Penthouse. Stylespot informs visitors about what their favorite celebrities wore, where they can buy it, or how to get the look for less. On their website, there are separate areas for visitors to shop for outfits specific celebrities have worn, a way to put a certain look together based on the designer or what celebrity fashionista vistors gravitate towards, and a way to discover the trends in pop culture fashion. Stylespot, founded by Rafi Gordon and Alex Amin, was venture backed by Idealab when it was founded in 2009. It has recently been acquired by Kaboodle, the online social shopping site owned by Hearst Corporation. Kaboodle announced the acquisition late Friday, February 3rd. Financial terms of the acquisition were not disclosed. According to Kaboodle, Gordon and Amin will continue as co-CEOs of the company, operating as an individual website Kaboodle also said that its Chief Operating Officer, Steven Chien, will report to Gordon as part of the merger. Together, these two companies are now known as Image Network, Inc. Gordon and Amin’s prior company was Baseline Research, which they sold to the New York Times Company in 2006. Congratulations to Stylespot. We wish them all the success. Inside view of 10951 Pico Building, where Stylespot grew from. PMI has provided creative office space for many other successful startups in Los Angeles and San Francisco in their early phase. Some well known tenants include Twitter, Applied Semantics, Aperture and Playdom. Check out our full list of tenants in this article. 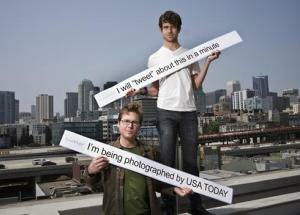 Jack Dorsey and Biz Stone of Twitter on the roof of PMI’s 539 Bryant building in San Francisco circa 2009. They started in a 4,000 square foot space with Round 1 financing.